Getting ready to teach your children or students how to interact with money? That’s fantastic! Not only will this building block help them learn mathematics like counting by fives and tens, but it will also prepare them for the workplace. 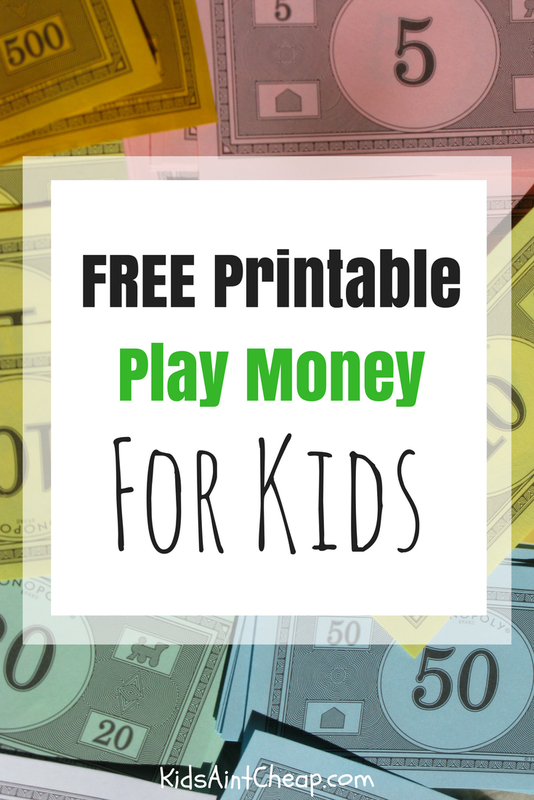 Let’s take a look at a variety of free printable kids money available on the Web. One of the most recognizable currencies for children (or at least this 90s kid) is the brightly colored money from the Hasbro game, Monopoly. These bills differ from U.S. currency in appearance but offer your children a chance to practice their counting, sorting, and hand-eye coordination skills. Download your free printable Monopoly money here. Customized printable sheets of play money – At StemSheets.com, you can customize the number and denomination of play coins you need on each sheet. For example, you can print off 20 coins of each value (up to a quarter) on a single piece of paper. That’s 80 coins – in color – on one sheet. Printable coins and coloring pages – Head over to EnchantedLearning.com to view printable images of quarters, dimes, nickels, and pennies. Also, view a myriad of coloring pages for your child to enjoy as they educate her about U.S. coins. Printable coin math worksheets – Ready to test your child’s knowledge of counting and making change? These free worksheets are great tools for just that. Fake Play Bills – Looking for fake $1, $5, $10, $20, $50, and $100 bills for your kids? Here is a complete list of free and printable play bills. These can engage your young child in a myriad of money lessons like counting, sorting, and even practicing good habits like using the envelope system. Grocery Task Cards – Print, cut, and laminate these terrific flash cards to quiz your child on prices at the grocery store. For example, she can use her fake money to pay for a $2 bag of popcorn or $1 bottle of water or do the math to pay for them both. Printable Play Checks – Is your child old enough to write? Then he’s old enough to learn how to write a check. Paper checks may seem archaic in today’s digital world, but it’s still a foundational skill from which your child will build his financial knowledge upon. For example, give him a set list of chores to complete, then pay with a check. Teach him how to understand the information on the check, endorse it properly on the back, and cash it. This will help him understand the role banks and employers will play in his life later, even if his paychecks are directly deposited. We’ve covered a number of tools and resources to help your child learn about money. From printable kids money to worksheets to blank checks, this list should provide a great place for you to start. Your next options are endless. Have fun along the way! Got any favorite ways to teach kids about money? We’d love to hear about them in the comments below!